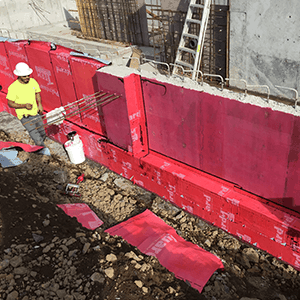 Q: WHAT’S THE DIFFERENCE BETWEEN TERM BARRIERS AND THE WATERPROOFING WE USE TODAY? 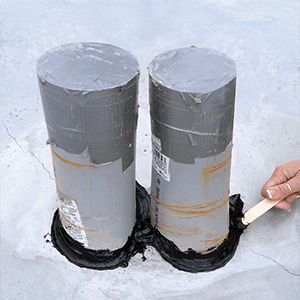 TERM’s waterproofing sealant installs and performs the same as it always has, but it has been upgraded to act as a non-chemical physical termite barrier. The biggest difference: It is necessary to seal the entire horizontal surface. Termites and other insects enter through slab joints, cracks, and penetrations. 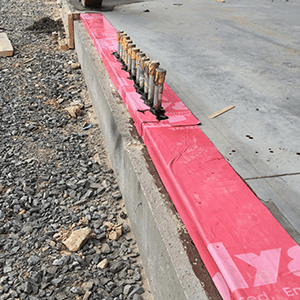 Underslab vapor barriers provide neither waterproofing nor a termite barrier. 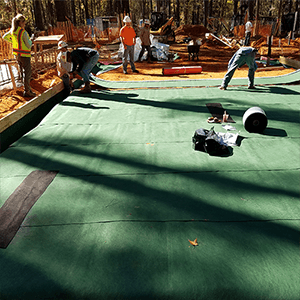 Underslab waterproofing has become common on commercial construction projects in recent years; TERM Underslab Barrier provides this full waterproofing, along with integrated physical termite barrier. None of these details add significantly to the project cost. Q: MY STATE REQUIRES PRETREATMENT BEFORE CONSTRUCTION. IF I BUILD USING TERM BARRIERS, AM I STILL REQUIRED TO HAVE A CHEMICAL TERMITE PRETREATMENT PRIOR TO CONSTRUCTION? A: The short answer is that you probably will. Many states have historically serious problems with subterranean termite destruction. 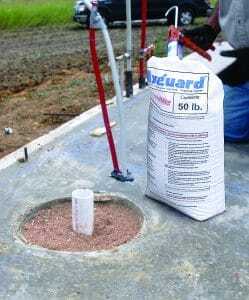 As a result, many states have in place rigorous and conservative qualifications for defining what constitutes an “acceptable termite pretreatment”. Thus TERM is being offered as a supplemental pretreatment until such time as regulators deem it acceptable. Also, note that incorporating a partial TERM Barrier into a structure will provide only partial exclusion of termites and pests. TERM Barriers only exclude termites from the portions of the structure where TERM has been directly, and correctly, applied. Even with the requirement for a chemical pretreatment, there should remain a significant long-term reduction in the need for pesticides during the life of the structure. Q. 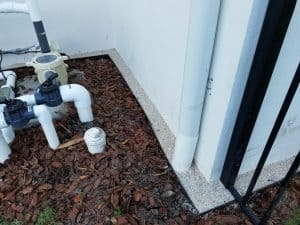 IS TERM A TERMITE SHIELD? A: Termite shields are a long-established method of termite exclusion. 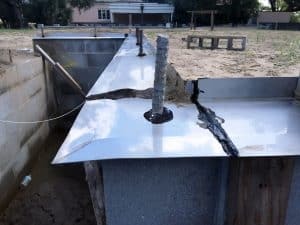 Termites can’t chew through steel, so they are forced outside of the structure, where they can be seen by an experienced pest management professional. TERM Barriers are similar to a termite shield in that termites cannot penetrate TERM barriers. 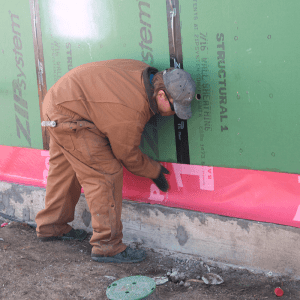 TERM is different from a termite shield because the TERM Barrier System can be installed almost everywhere around the structure where cracks, gaps, joints, etc. exist. Termite shields have seams and penetrations where termites can penetrate; these gaps should be sealed with TERM Sealant Barrier, as shown in the photo taken during construction of a home in the New Orleans area. Q: WHAT DOES “TERM” STAND FOR? 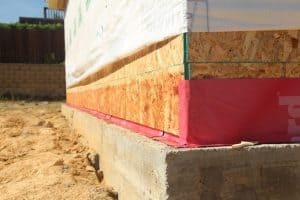 A: The “T” stands of course for “termite barrier.” The “E” stands for “energy leak barrier.” The “R” stands for “radioactive radon barrier.” And the “M” stands for “moisture and water barrier.” All four of these properties contribute to sustainable construction. Q: WHAT DOES IT COST TO ADD TERM TO A STRUCTURE? A: Refer to this page for more information to help with estimating the cost. TERM was designed with the concept that the termite barrier should be integrated with waterproofing materials already in use. 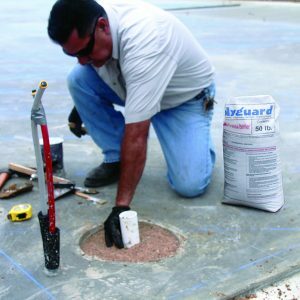 Polyguard produces a wide range of building envelope materials which seal out water and seal off energy leaks. 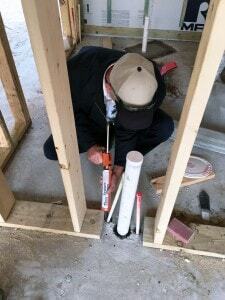 The goal, which is now achieved, is to use the same materials to also seal out termites from the structure. 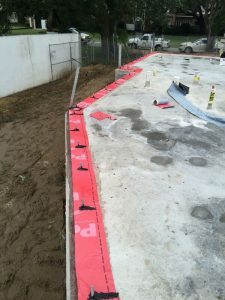 Having achieved that goal, we can state that, wherever the building envelope uses the widely accepted “peel and stick” materials using asphalt modified polymers are being used – in other words the type of waterproofing which Polyguard has been supplying, the addition of TERM Barriers to the project should only cause a slight to moderate increase in project cost. 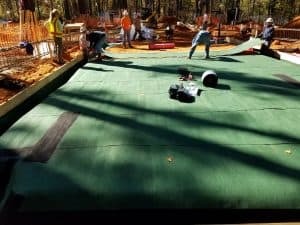 Anyway, if you are one of those who has already moved to full underslab waterproofing, the incremental cost of TERM Underslab Barrier should be moderate. Comments on the most significant TERM commercial applications are below.